There are a lot of reasons to look forward to Wolfenstein II. Like the last one, it promises to be an immaculately designed shooter with tight, intuitive level design and an endless opportunity to kill Nazis. But also notable is an early showcase of the developer’s attention to detail as seen in the game’s opening sequence. As I wrote during PAX West 2017, in it, the protagonist B.J. Blazkowicz, captive aboard a German Nazi naval vessel, is confined to a wheelchair after a serious injury. 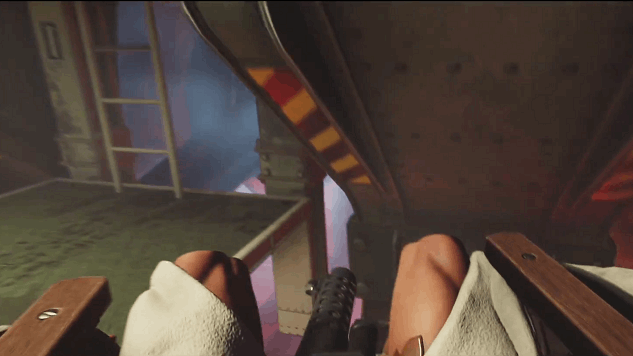 The following gameplay section sees Blazkowicz navigating the ship’s maze like machinations from the confines of the apparatus, encountering various obstacles and finding strategic solutions around them along the way. It’ll be interesting to see how other disabled persons respond to the game. For us, overcoming limitations isn’t a fascinating source of inspiration, it’s just another part of our daily life. My hope is that players who are more physically capable are able to gain some insight into the many workarounds that those with limited mobility have to use daily. Perhaps it will inspire some of them to rethink some of the mechanisms we build to navigate the world around us, and design them in a more considerate way. Until then, hey, Bethesda, maybe give some thought to an extreme sports wheelchair combat game?